Anyone craving Chicken Enchiladas! I am after reading Scarlett’s recipe! Please welcome back Scarlett, from Made it Ate it Loved it. She’s got a delicious Mexican entree to share with us today! I feel like I have tried 100 different recipes for enchiladas. Some I really like and some not so much. This one turned out to be different then most recipes I have tried. The good thing about these ones is that they actually do not take enchilada sauce. The ingredients in these are ingredients that I usually have right in my fridge. I have left over chicken from my Crockpot Rotisserie Chicken so I decided to give this recipe a try! They were very cheesy and creamy! Not spicy at all. 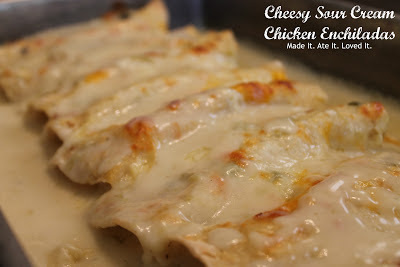 They are very kid friendly unlike some of the other enchilada recipes I have tried. So if you are in the mood for enchiladas but don’t actually have enchilada sauce give this recipe a try! These enchiladas can be made ahead and they can be put in the freezer (before you add the sauce). The sauce needs to be made the day of. Thanks Joyful Momma’s Kitchen for the recipe! Preheat over to 350 degrees. Grab a 9×13 pan and lightly grease it. Mix chicken and 2 cups of cheese in a bowl. Take the corn tortillas and grab a small handful of chicken and cheese mixture and place of tortilla and roll up. Roll up all 8 tortillas and place in a line in baking disk. In a medium sauce pan melt butter on low. Then turn up to medium heat and add flour while continuing to wisk until all mixed together. Add water and bullion. Bring to a boil. Sauce should be thickening up. Add green chilis and remove off heat. Add sour cream. (DO NOT place back on burner or the sour cream will curdle.) Mix together and then pour over enchiladas. Add the remaining cup of cheese evenly over all enchiladas. Place in oven for 25 minutes. Then turn onto 500 degrees broil and let the cheese begin to bubble for about 4 minutes or once the cheese is lightly browning. [yumprint-recipe id=’4′]Thanks for sharing this delicious dish with us Scarlett! I LOVE enchiladas so I can’t wait to try them out! Looking for more Mexican dishes? Try my Chorizo Taco recipe! YUM!! Oh wow. These sound delicious and super easy! Pinning to try! Thanks Scarlett for sharing! !